From the edge of the New Forest to its border with Devon, Dorset offers a wealth of perfect spots for camping and glamping. This unspoilt county marks the start of England’s south-west with a countryside that’s inspired literary greats and a coastline that’s world class. The soaring cliffs of the Jurassic Coast protect sandy beaches, while, inland, more than 40 per cent of the country is a designated Area of Outstanding Natural Beauty. But while its natural highlights come on a grand scale some of the best things about Dorset are small and bijou – the campsites. We love them and we think you will too! Whether you want a city escape or a campsite in the countryside within easy reach of the main attractions, discover the best Bournemouth campsites with this hand-picked collection, all chosen by the travel experts at Cool Camping. Its hard to imagine the inland town of Bridport was once an important port before its two rivers silted up. Today, it’s a lively market town with an alternative vibe, and a good selection of cafés, restaurants and shops, plus a host of excellent campsites in the surrounding countryside. As always, only the best make the cut for Cool Camping – which will you choose? The hilltop ruins of Corfe Castle in Dorset appears as if from an Enid Blyton novel, with the Swanage Railway steam train puffing past and the rolling greenery of Dorset's Purbeck Hills all around. Discover the best campsites in the area with this hand-picked collection of favourites, all chosen by the travel experts at Cool Camping. Want to go camping near one of England's most famous coastal landmarks? Set on Dorset's Jurassic Coast, Durdle Door is a near-perfect limestone arch at one end of a crescent beach. There are a number of good campsites nearby, perfectly placed so you can make your way down to the coast at sunset and watch the sun twinkle its way through the arch and into the sea beyond. At the heart of the Jurassic Coast, Dorset's Lulworth Cove is an almost totally circular shingle bay nestled below dramatic cliffs. Within a few miles of the cove there are heaps of great campsites, though only the very best make the Cool Camping cut. Which Lulworth campsite will you choose? Walk the cobb, browse the art galleries, build sand castles on the beach and explore the rest of Jane Austen’s favourite Dorset town, Lyme Regis, on a camping holiday, with this hand-picked collection of incredible campsites chosen by the experts at Cool Camping. From the narrow streets of Poole’s old town to the hive of boating activity down by the quay, Poole in Dorset offers endless intrigue during any camping holiday. There are heaps of great campsites within striking distance of the town but only the very best make the Cool Camping cut. Which Poole campsite will you choose? Stretching for four sandy miles from Shell Bay to the base of the Old Harry Rocks, Studland Bay is one of Dorset, if not England's, best beaches and is a must-visit during any camping trip to Dorset. There are heaps of campsites near Studland, by the bay itself and in the surrounding countryside beyond, but only the best make the cut for Cool Camping. Whether it's catching crabs from Swanage Pier or riding the steam train out to Corfe Castle, enjoy the delights of a Swanage camping holiday with this collection of hand-picked campsite recommendations from the experts at Cool Camping. Between the rivers Piddle and Frome, the historic market town of Wareham in Dorset is both compact and well-stocked, with plenty to keep you busy. However you amuse yourself, there are ample Wareham camping options nearby, with a host of campsites in the local countryside. Only the best make the Cool Camping cut, though. Which one will you choose? West Bay campsites are a recipe for holiday success: Quick access to the well-known beach – the setting for BBC hit series Broadchurch – and picturesque stop-offs in the harbour, as well as excellent seaside walks atop the cliffs. 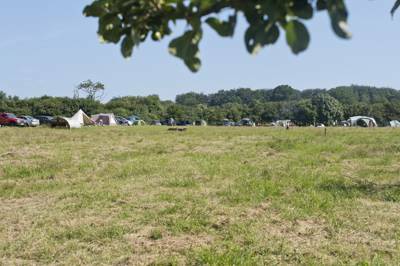 There are plenty of West Bay campsites in the surrounding countryside but only the best make the cut for Cool Camping. From the downtown attractions to the Isle of Portland and the beaches of the local coast, discover Weymouth and its surroundings with this hand-picked collection of the best campsites in Weymouth and around. Dorset is a county of contrasts, offering beautiful countryside and a stunning coastline, ancient ruins and modern family attractions. All of these things combined make it one of the best places to go camping or glamping in the UK. Home to the famous Jurassic Coast, with its craggy rocks and steep cliffs, you’ll find plenty of campsites that capitalize on the good views or the shelter of pebbled bays. Seaside campsites and campsites within walking distance of the beach aren’t hard to find and, away from the seaside and beaches, there are ample opportunities for camping in the countryside too. There are great campsites all across Dorset whether you’re looking for a place to pitch your tent or somewhere to park up in a campervan or caravan. 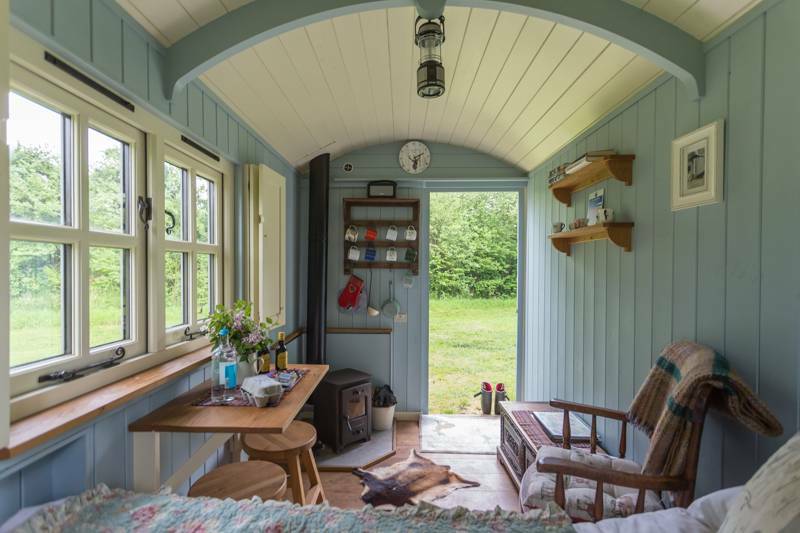 And, with glamping in Dorset growing in popularity, you can now leave your tent at home and spend nights in a yurt, shepherd's hut or gypsy caravan instead. As always, we at Cool Camping have bypassed the big commercial holiday parks and plucked only the very best campsites in Dorset for our collection. Browse our favourite Dorset campsites now and book your next adventure online today. Dorset is rich in history and, although tourism in around the county has increased over the years, the region’s heritage remains protected thanks to organisations including the National Trust, English Heritage and UNESCO who have recognised and protected some of the most special places. The jewel in Dorset’s crown, of course. is the Jurassic Coast which is designated as a World Heritage Site where fossil finds and rocks have documented a staggering 185 million years of history. On a camping holiday in Dorset today, fossil hunting on the beach makes for a great day out and can still unearth a host of treasure. Particularly good beaches to find fossils are Kimmeridge Bay and Charmouth but simply walking along Dorset’s coastal paths is enough to give you an appreciation of its fascinating geology. The Dorset countryside also lays claim to some historic sites which tell of its rich past. The county remains rural through and through, with much of its heritage respecting lost legends. From Thomas Hardy’s birthplace, a tiny cottage in rural countryside, to Sherborne New Castle, once the home of Sir Walter Raleigh, there are sights and sounds of the past galore. You can visit the enchanting ruins of Corfe Castle or step back even further to the Iron Age and explore the site of Maiden Castle, one of Europe’s greatest hillforts. If you're looking for a campsite near the beach in Dorset then you needn't fret. While much of the coastline is thankfully protected from development, small-scale campsites and farm meadows still offer ample opportunities for you to park up your campervan or pitch your tent within strolling distance of the sand or shingle. In fact, because Dorset’s coast is largely undeveloped, camping and glamping offer the best way to get close to the coast. 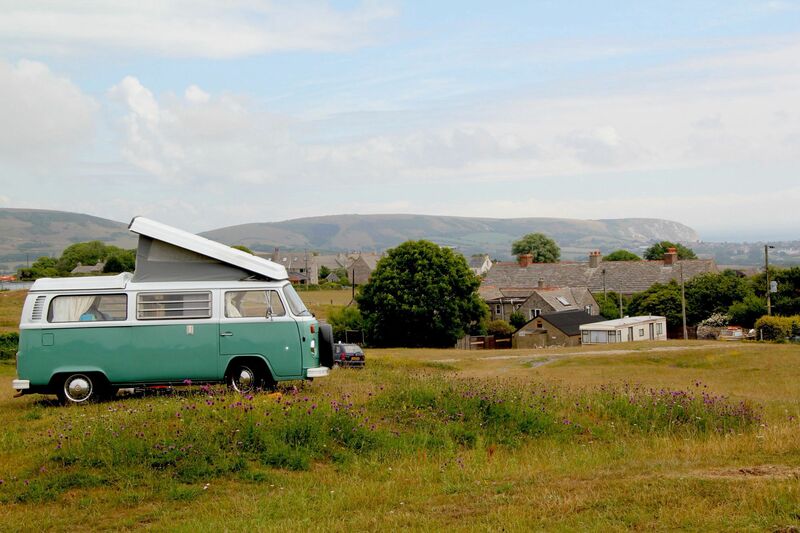 So, whether you're after a traditional camping spot a stone's throw from Durdle Door or you want to have a family gathering overlooking the Isle of Portland, there'll be a campsite to suit your needs. Some campsites are around for summer only – pop-up campsites that farms run during the school summer holidays but graze during the rest of the year, while other campsites are open all year round. Whatever the season, come rain or shine, you can always enjoy a seaside camping holiday in Dorset and with the beach so close by you’ll never be short of things to do. Swimming, sandcastle-building and strolling on sandy shores, rockpooling, fossil-hunting and watersports: seaside camping in Dorset can be as active or as relaxed as you like. One of Dorset’s most-famous former residents, Thomas Hardy, drew on the scenery of his home county to write novels including Far From the Madding Crowd. If it’s a rural retreat you’re after, what could be better than camping in the Dorset countryside that’s become known as Hardy Country? It’s the perfect place to relax – far from crowds of any sort. 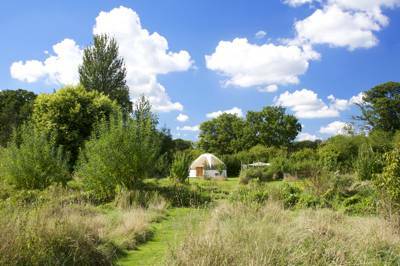 You can wake up to the sound of birdsong, rest your eyes on the green farmland of this largely rural county, cook up a feast using delicious local produce and fall asleep under starry skies undisturbed by light pollution. Sound like bliss? Then you better get packing and book yourself in for a taste of the good life on one of the many excellent country campsites in Dorset. There are farm-based campsites where you can immerse yourself in the rural way of life and campsites based among the trees of orchards and woodlands. 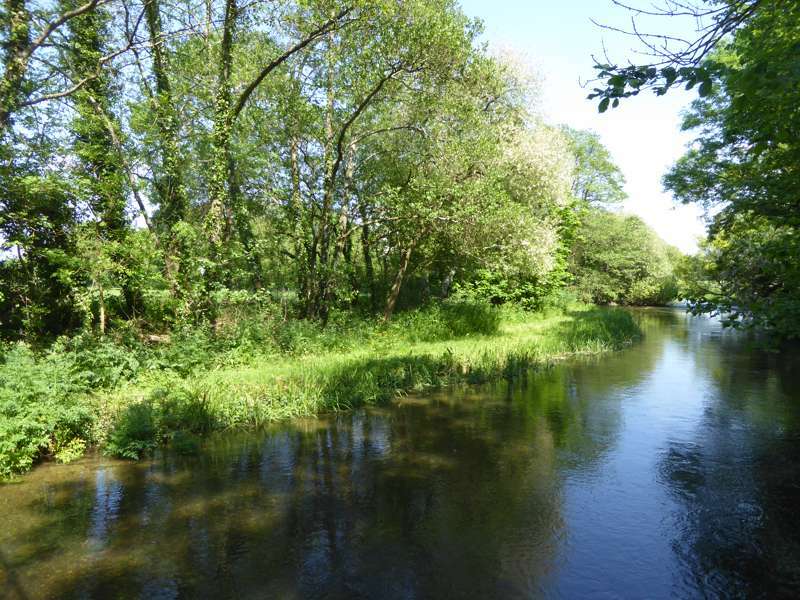 More than 40 per cent of Dorset falls in to the Dorset Area of Outstanding Natural Beauty and many of the best campsites we’ve found in the county are based in that area. Walking, picnicking and cycling offer great days out in the Dorset countryside but there are plenty of rural attractions too from small-scale farm attractions to historic castles and grand houses. Most campsites will have information about the walking routes and attractions that are closest to the campsite but there’s lots of information on the Visit Dorset website too. While history lovers flock to the Jurassic Coast for their chance to find ancient fossils and geologists marvel at the stones of Chesil Beach, it's families that really rule the roost here during summer time. Dorset has long been one of the most popular holiday locations in the UK, easily reached from much of the country and offering the ideal blend of seaside, countryside and (reasonably) reliable weather. The easy-going mix of ice-cream stalls, family-friendly restaurants and pubs that welcome muddy boots, muddy dogs and muddy children, makes the county a rightfully top spot for families and, thankfully, there are plenty of great campsites to boot. Lots of campsites know their audience well and specifically cater to families with the likes of family-sized washrooms, baby-changing facilities and cheap rates for children. Some have play equipment and activities specifically to keep kids occupied and the natural delights of both seaside and farm-based sites are likely to go down well with younger campers. That’s not to mention the fact that the adventure of sleeping under canvas, the chance to play outdoors all day and to make new friends on site, make camping holidays a winner with almost all children. The only issue you’re likely to have is persuading them to get in the car to go home again at the end of the holiday! While the summer holidays might attract families in large numbers, Dorset also offers some tucked away retreats that are just for grown-ups. There are both adults-only camping and glamping sites that offer quiet getaways, whether you visit in the low-season or the height of summer. With so many historic attractions, charming rural villages and interesting seaside resorts, there’s plenty of places that make for great days out without kids in tow. Wildlife watching, walking and eating out are all easy on an adults-only camping holiday too. Whether you are camping as an individual, as a couple or with friends, if it’s an adults-only trip, you don’t need to stick to adults-only sites. How about mid-week camping? Or camping in spring or autumn? If you are unrestricted by the school holidays you can often find last-minute stays, great-value deals and a quieter site too – all advantages of camping without kids. If it’s romantic camping you’re after, the same rules apply: quieter times on site and more secluded spots tend to make for a more romantic atmosphere. With candlelight, campfires and time together away from the stresses of work, chores and children, camping and glamping make for an ideal romantic break. Looking for luxury? Don't own a tent? Or simply don't fancy the faff of loading up the car and going on a camping holiday? Dorset is home to one of the very first glamping locations in the UK and has long been ahead of the game when it comes to offering luxury in the great outdoors. A glamping holiday in Dorset is great for people who want the adventure of camping among the county’s gorgeous scenery but don’t want to scrimp on comfort. It’s also great for first-time campers, families with young children and families who are divided in their love of camping – a sort of half-way house between camping and a self-catering cottage or hotel. 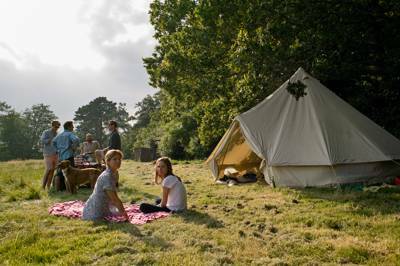 From bell tents in the summer to cosy shepherd's huts hidden among the trees during the autumn and winter months, there is something for everyone here. And the range of accommodation continues to grow from treehouses to tipis, modern geodesic domes to old-fashioned gypsy caravans. Some glamping sites will have the works – hot tubs, activities, bottles of bubbly and freshly cooked meals – while other locations will simply offer comfortable off-grid accommodation that saves you the time of bringing your own tent along. There are sites where you can enjoy the sociable side of campsite life and places where your glamping accommodation is out on its own offering seclusion, peace and privacy. Whatever you look for in a glamping holiday, you’ll find it in Dorset. 1. Picnic at Lulworth Cove and marvel at Durdle Door’s iconic arch. 2. Have an ice cream on Bournemouth beach. 3. Take a walk along the South West Coast path. 4. Visit Thomas Hardy’s birthplace. 5. Breathe in Dorset’s history at Maiden Castle. 6. Go fossil hunting at Kimmeridge Bay or Charmouth. 7. Walk out on the Cobb, harbour wall, at Lyme Regis. 8. Swim in the sea and build sandcastles on the beach. 9. Watch wildlife in the Dorset countryside or at RSPB Arne. 10. Feast on local produce from farm shops or farmers’ markets. Dorset is a real land of contrast, from the cliffs of the Jurassic Coast that protect sandy beaches, like Charmouth, and sheltered bays, like Lulworth Cove, to the inland patchwork of fertile farmland and rolling countryside immortalised in the novels of Thomas Hardy. The grand scenery gives way to delightful small, picture-perfect villages and crumbling hilltop castles. 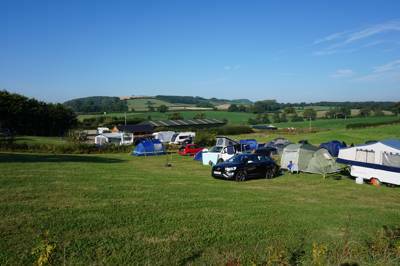 Campsites in Dorset, too, tend to be smaller, independently-owned places, often on farms or smallholdings. These are the sort of places that the Cool Camping team love and, while out on our travels, we're always keen to share not only the latest campsites, but also the best pubs, eateries and beaches we visit too. Of course, for full details on the county's attractions, we can beat the likes of the official Visit Dorset website, which is always a good place to get up to speed with the very latest events and activities in the county. But for a little outdoor inspiration and tips on what to do in and around the county, check out or latest blogs and discussions too. wherever you pitch your tent in the county everything seems to be in easy reach. The history of Lyme Regis, Cerne Abbas, Dorchester, Swanage and more are all just a drive (or steam train journey) away, while the beaches give way to some of the most majestic countryside in all of England, folding back into the Cranbourne Chase Area of Outstanding Natural Beauty. The campsites here are almost invariably family-run establishments, many on small farms or secreted away in the private gardens of grand houses, and local attractions are family-friendly and easily accessible. For a family camping break, we can think of few better places in the UK and, whether it's re-enacting Hovis adverts or swimming in the shadow of famous Durdle Door, you'll find fun and excitement at every turn. 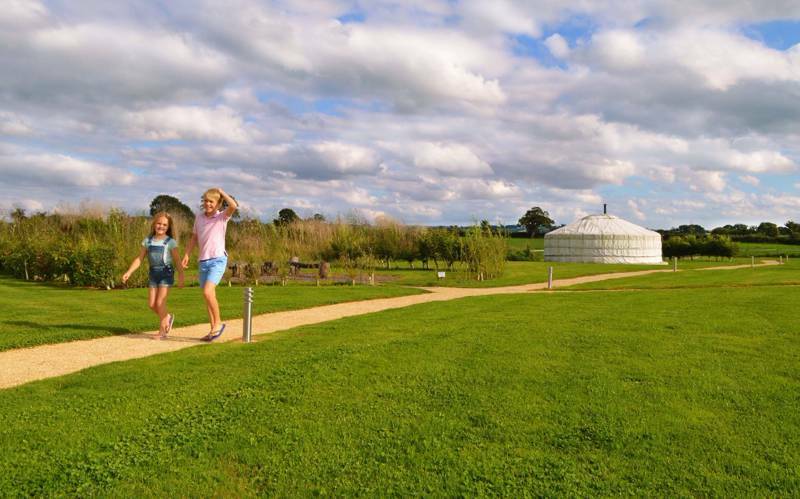 Dorset, Camping in Dorset, Campsites in Dorset, Dorset Campsites, Camping Dorset, Glamping in Dorset, Glamping Sites in Dorset, Dorset Glamping, Glamping Dorset, at Campsites in Dorset, You can’t beat camping in Dorset. Looking for a campsite? Browse this collection of expertly-chosen campsites from the Cool Camping team, including seaside campsites, woodland campsites, dog-friendly campsites and even luxury glamping in Dorset, all available to book online at the very best price.